. 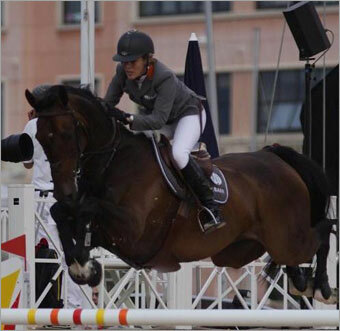 :: GLOBAL CHAMPIONS TOUR OF PORTUGAL, ESTORIL ::. The 100,000 Euro Grand Prix of Portugal, presented by the City Council of Cascais and Estoril Turismo, began with an immediate clear round from Azerbaijan's Patrick McEntee but if anyone was lulled into a state of security by this innocuous start they were soon disabused of the notion. The first round course contained open water, two doubles and a tricky viaduct wall which by the end of the first round had produced 16 clear rounds. Although Jessica Kurten on Castle Forbes Libertina, Kevin Staut on Le Prestige St Lois and Laura Kraut on Cedric were among recent GP prize winners who did not make the cut, there were plenty of big names who did include Jos Lansink, Richard Spooner and Marcus Ehning as well as Tour leader and Turin winner Marco Kutsher. In the second round, the last fence, the GCT Planks - stopped Marcus Ehning on Plot Blue and Richard Spooner on Cristallo, and to the surprise of the audience it was Azerbaijans Jamal Rahimov on Aramis who was the first to go double clear along with his countryman Patrick McEntee on Ever Mury Marais who forced the jump off! They were soon joined by four riders who only need to be introduced by their first names to identify them to the show jumping world: Marco, Jos, Christian and Meredith. Both the eastern European riders had rails in the against the clock round, as did Christian Alhmann but the latter who was well placed on Taloubet in Monaco will not be too disappointed with how he is coming along on a relatively new ride. Marco Kutscher and Cash were the first to go clear again but seemed not to be going too fast, which is usual with the horse's giant stride at 45.82 seconds that was respectable enough so that Jos on Cavalor Valentina van T'Heike made no effort to catch him. The World Champion crossed the line in sedate 51.82. That left the rider who had been fastest in the second round to see if Marco Kutscher could be prevented from winning another GCT Grand Prix. And to give him credit, the horse who lives in the shadow of Shutterfly could not have jumped a more perfect round to bring his clearly delighted rider home penalty free in 44.11. Earlier there was a sense of deja vu as the French say, over the showground when Roger Yves Bost and Jovis de Ravel added another 6,000 Euro to their prize fund, started with their win on Friday. The Prova Mercedes-Benz Class was not pure speed but a two phase contest in which course designer Frank Rothenburger had been deceptively kind with the first phase course. 21 of the 35 starters made it to the timed section. But in this rails fell rather more frequently especially once Roger, tenth to go, set an almost unbelievable second phase time of 29.61 which all the others then had to catch. He had left absolutely no room for improvement and nobody managed to get close to that time but trying to do so did ensure some notable casualties. All conquering AD Norson and Alvaro de Miranda were one, Daniel Deusser and Vonka A were another. In fact there were only eight double clears and next best was Marco Kutcher and Monaco winner Gut Neuenhofs Lea. Harrie Smolders went one better than last night to take third on Exquis Powerfee. Marco Kutsher still leads the GCT rankings on the Road to Rio and the 1,000,000 Euro bonus as the Tour moves to its seventh leg at a new series venue, Chantilly, France (July 21-24). Meredith: "This is my biggest win since I had my baby and I am thrilled as it is so important having missed so much training and competing. Do I ride any different since I had her, no I don't think I do." Jos Lansink: "There is still a way to go to Rio so it is not over, I may catch Marco." Roger Yves Bost: "Yes I think you can say my horse loves this place, but also I think I ride a bit better. I fell off twice in the collecting ring, I think this makes me!"